New Delhi, Aug. 19. Posted at 11.58 AM IST : The latest symbol of the national aspiration for a corrupt free India -Anna Hazare , finally came out of Tihar jail in Delhi after 68 hours. He was greeted with cheers of the thousands of his supporters camping outside the jail for the past 3 days. 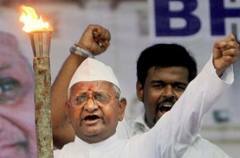 Anna was arrested by the police on August 16, when he was to proceed to J.P.Park in New Delhi to sit on a fast unto death. It was to press his demand for an effective Lok Pal bill in place of a lackluster bill in presented in the Lok Sabha, presented by the Manmohan Singh government. He went ahead with his fast even when lodged in the jail. The arrest created an uproar in the country and people took to the streets holding rallies and torch light processions to support Anna and condemn the government’s oppressive act. This forced the arrogant UPA government to retreat. Release orders were issued in a haste within few hours of the arrest but Anna refused to come out. He wanted the permission to fast without unjustified conditions, as were imposed earlier by Delhi Police. The unprecedented support to the Anna movement in the country had left the decision makers with no option to withdraw their shameful 22 conditions. Now the Anna fast shall continue at the Ramlila Maidan, the venue denied earlier by the police.